Cast: Kwon Sang Woo, Yoona, Song Chang Eui and Han Eun Jung. Oh Dae San (Kwon Sang Woo) sells clothes at a market, and dreams of turning his little store in to a big clothing line. He is smart and talkative which helps him when he need to butter up to customers and other salespeople. When a fellow store keeper, from the same market, falls ill, the daughter Seo Yoo Jin (Yoona) of the store keeper returns from Paris, only to have him pass away shortly. Due to the financial issues, and partly to blame for the financial issues, Dae San decides to help Yoo Jin and her mother get on their feet again. This leads Yoo Jin and Dae San to become close. At the same time Dae San meets Lee Joon Hee (Kwon Sang Woo), a rich chaebol of a fashion empire, who looks exactly alike him. Joon Hee asks Dae San to impersonate him for a week, so he can leave the business without having to worry about his competitor and cousin Lee Jae Min taking his place. 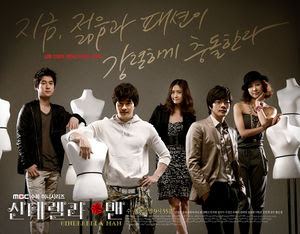 This drama was one of those I downloaded ages ago, but never really got around to watch. Besides it being almost 10 years old, I gotta say it’s alright. Though I felt it was very cliché and had the unnecessary jealousy. I mean most of the dramas that are like this one, are so male dominant. The lead actress only serves as the love interest for the two male characters, and to be honest both are boring love stories. And the fact that it was Yoona, didn’t make the character better. The casting was also mediocre, mainly because the characters were 2 dimensional - even the male lead who did try but failed. Besides that, I kind of enjoyed the storyline, though it was very cliché. I do like a badass revenge plot, but it must be well crafted - and this one is alright. So, all in all an alright drama, to watch because of the story and not romance.